DENVER – In a proclamation, the Denver Housing Authority has recognized Santa’s Elves – Kids Giving to Kids as a significant partner in helping improve the lives of low income families. 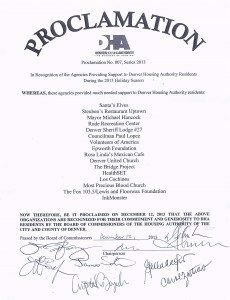 The proclamation thanks Santa’s Elves for “…providing much needed support…commitment and generosity…” to Denver Housing Authority residents during the 2013 holiday season. 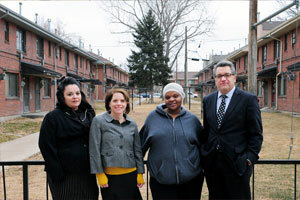 “We’re thrilled to be acknowledged for our hard work. But really, the credit belongs to all of the moms and dads and their little elves across the state who decide to give presents to these children every year. It ends up being a win-win for everyone involved. Parents get to teach their own children about giving back, while other kids who don’t have as much get really wonderful gifts around the holidays,” Deborah Sherman, founder of Santa’s Elves said. The board of commissioners signed the proclamation December 12, 2013. The board also recognized the Rude Recreation Center and Rosa Linda’s Mexican Cafe, both big partners in the kids-giving-to-kids event that happens annually around Christmas time at the recreation center in Denver. The kids giving to kids project began in 2010 after then 9NEWS Investigative Reporter and mom Deborah Sherman wanted to teach her son about giving. She told some friends about the idea, and together, moms Deborah, Jennifer Ramirez and Stella Castro, created the event. The first year, they gave away about 200 presents. But last year, the non profit reached new heights. Parents and kids who connected with needy children in the state’s poorest neighborhood gave thousands of gifts to more than 1,200 children. If you want to get your family or business involved in the giving event where people meet face to face, go to the website www.santaselvesdenver.org for details and to sign up in 2014.